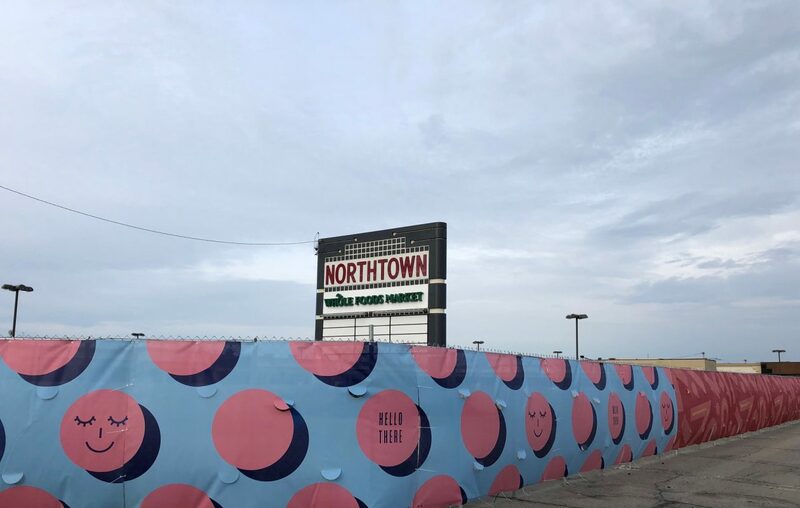 This vinyl banner briefly covered the chain-link fence that surrounds most of the former Northtown Plaza property, where WS Development awaits approval from state regulators before the company can begin demolition work on the site. Demolition and construction work at the Northtown Plaza can’t begin until environmental regulators approve the developer’s plan to address sewer capacity issues on and around the site. A WS Development official said the sewer issue isn’t a serious concern and shouldn’t delay the start of demolition, now eyed for late spring or early summer. “This isn’t the hold-up for us,” said Brian Sciera, WS Development’s senior vice president of leasing, who did not provide a firm start date for the work. WS Development plans to transform the largely vacant shopping plaza into a retail and entertainment destination, but it has to show the state Department of Environmental Conservation that the sanitary sewer system in that section of Eggertsville can handle the wastewater generated by the development. Amherst already has signed off on the sewer plan submitted by WS Development’s engineer, Town Engineer Jeffrey Burroughs said. The state is reviewing that report.